I have this habit of using the adjectival form of the season of Lent: “Lenten.” In Rebecca’s private language (my Inuit friends might call it uliipikatitut), “Lenten” means this: anything difficult or a with a sense of privation, with the result of causing reflection. During Lent, suddenly anything even slightly less than awesome is “Lenten.” It’s not just lame, or underwhelming, or disappointing, or painful. It’s “Lenten.” Having oatmeal for breakfast every day is “Lenten.” Giving up chocolate is “Lenten.” There’s really no deprivation too small or petty for me to apply this adjective to it, nor any reflection too momentary. And believe me, Lent makes me pretty petty and slight. This all stems from a childhood steeped in Roman Catholic culture, where we all did our best to give up something small for Lent, then reflected on how our small deprivations were really nothing in comparison to Christ’s sacrifice. I do not mean to criticize this practice; obviously I still practice it. But I think we all had that sense of embarrassment, that we were giving up chocolate to try to be more like Jesus, who died and gruesome and horrible death for our sakes. If the priest played his homily right, it made us squirm just a little bit in the consumeristic religiosity of our materialistic lifestyles. The point, I think, of my subconscious shift to the use of this adjective, is to try to reframe my complaints. The very ridiculousness of the adjective is self-referential: it points to how petty my wants are, to how small my sacrifices are, to how incredibly focused I get on my own comfort. It’s a way to laugh at myself. But, tongue-in-cheek though it is, this silly little adjective can come full circle. On the one hand, no, it’s not a very “Lenten” project, objectively. But it’s become Lenten, because I really don’t want to work on it. I actually dread picking it up. However, once I do pick it up, it’s really enjoyable. I’m into a nice rhythm, the chart is clear, and it’s got lots of nice benchmarks to feel like I’m progressing. 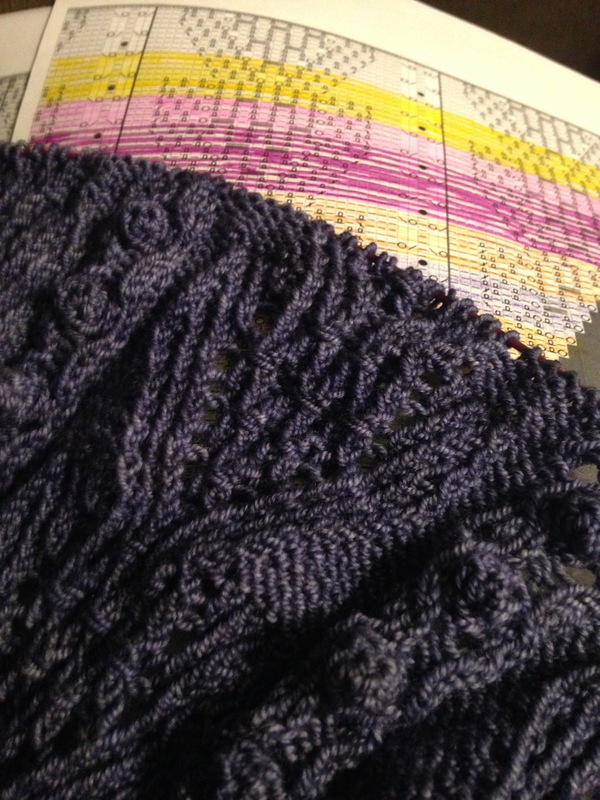 The yarn is simply perfect for the pattern, and I’m working it at a good gauge for the needles. I really have no reason to complain. I just don’t want to pick it up. There’s nothing compelling about it. It takes all my attention, and robs me of time I’d rather be spinning, or at least knitting something more insta-gratifying. 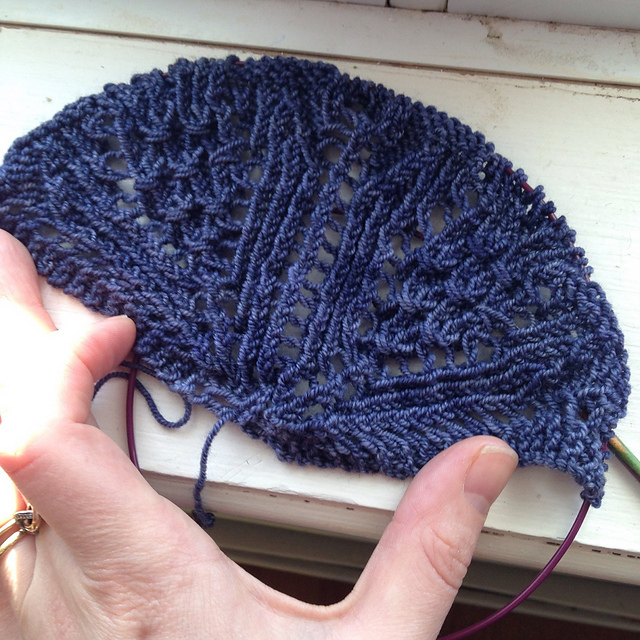 Halfway through Lent and I think I’m halfway through … the first ball of yarn. I’ve already accepted that this is going to be my vacation knitting. That actually sounds a lot like my relationship with God. I have been reading the Bible all my life, but I still find a strong inner resistance to quiet time. Not when I’m doing it – when I actually connect with God through Bible reading, prayer, meditation, and reflection, it is life and peace and restoration. It is absolutely the fuel that powers me for the rest of my life. But when I’m not doing it, I don’t want to do it. And if I skip a day or two, the resistance becomes harder and harder to overcome. I resist it because there are other things, me-centered things, that I’d rather be doing. I resist it because it demands all of myself; it demands I come out of myself; it demands I be totally real and vulnerable with God. That’s hard. Sometimes I’d rather not face those deep parts of myself, even if it’s to take them to God for help. So my Lenten KAL shawl is the embodiment of this inner struggle, a physical reminder of how something objectively good and beautiful can be repulsive to me just because it is demanding. That is what something “Lenten” really is: it makes us face ourselves. It isn’t something that makes us feel good because we have successfully accomplished some feat of asceticism, of self-denial. It’s something that brings us face to face with our own failures, so we have no choice but to accept grace. We can set ourselves up for such encounters by denying ourselves of some comforts, because that tends to bring our failures to the surface. But it isn’t the denial that makes it Lenten: it’s the way God gracefully uses our slightest sufferings to point us to his greatest suffering on our behalf, which provided, once for all, all the grace we’ll ever need. How about you? Have you had some nice failures with your Lenten disciplines yet? Share your stories in the comments!